Made of canvas and designed after the new Million Dollar Bill tract, this wallet is perfect for holding your tracts and grabbing people’s attention when you open it up to hand them one. Fits all our standard sized million dollar notes/bills. 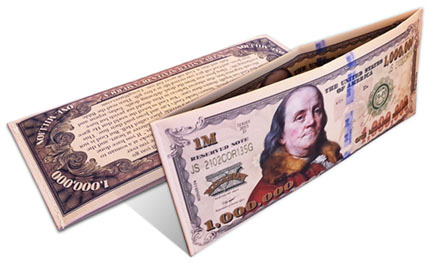 Be the first to review “Million Dollar Bill Wallet” Click here to cancel reply.